Why Are People More Scared of Heroin Addiction than Prescription Drug Addiction? Prescription drug abuse is the bigger issue, so why isn't it the bigger fear? Society tends to condemn drugs and the people who choose to use them, but let's face it: some drugs are more socially acceptable than others are. The most obvious examples are heroin and prescription painkillers. The differences might seem obvious at first. After all, pharmaceutical narcotics are legal with a prescription, but heroin is a Schedule I opiate that you could be jailed for possessing. However, pharmacies are called drug stores for a reason. Americans misuse prescription drugs at higher rates than ever before, but every year, another "heroin epidemic" distracts from this bigger problem. The chemical makeup and desired effects of heroin and prescription opiates are virtually identical, so why do we fear one so much more than the other? Learn why and how heroin addiction is stigmatized as a dangerous epidemic, while the larger prescription drug misuse remains largely invisible and overlooked. The "junkie" stereotype is a convenient way to discriminate against marginalized members of society, because it's largely associated with urban drug dens and homeless or low-income users. Lawmakers and law enforcement officers have encouraged and perpetuated this agenda for decades, incarcerating poor heroin users and implementing fear-based, anti-heroin education programs as part of the ongoing War on Drugs. Despite the stereotype, heavy opiate use actually happens in every community, class, and race. However, even the perceptions of treatment options are very different. Methadone clinics are visible and common in urban neighborhoods, while in the suburbs, no one notices people filling prescriptions for naloxone, buprenorphine, and other opioid antagonists that suppress the effects of prescription opiates and heroin alike. Millions of Americans take prescription stimulants and painkillers every day, so it's very easy to see why this stereotype has persisted for so long. It's easier to feel superior to someone who's taking a different kind of drug, especially when the drug is portrayed as dangerous and the users seem to exist outside your class and community. It also explains why parents and educators are so desperate to warn kids about heroin addiction, but don't fear they'll misuse their prescription pills. If you took a painkiller with a glass of filtered water in your spotless suburban kitchen, most people wouldn't immediately make assumptions about you (or fear for your safety). However, if you injected heroin into your arm in a dirty, urban drug den, you'd be considered a "junkie" who's on the brink of death or at least at risk of catching some harmful infection. When drug paraphernalia, HIV, and other disease risks enter the picture, the problem seems more illicit, scary and foreign to many people. Heroin users don't exclusively inject their drugs, but because intravenous injection is the most common and widely known method of consumption, most people associate heroin with shared needles and "track marks". 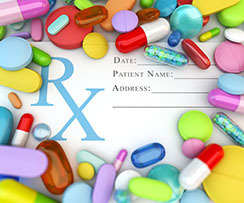 Prescription pills, on the other hand, are simply swallowed like any over-the-counter medicine and can seem "safer" and more relatable although prescription opioids are as deadly as heroin. The body isn't fooled — just us. In most communities, heroin is harder to obtain than a legal prescription. As a result, people must resort to illegal means of procuring it, and as their habit worsens, these behaviors might get riskier. Dealers stand on street corners and risk arrest, while physicians and pharmacists with professional and medical degrees operate out of medical clinics and pharmacies. Pills in a legal bottle simply seem safer than powder in a baggie. Obviously, much of this is because of the law. However, prescription opiate misuse can lead to death, and it often starts with a legal prescription. Many states have tightened laws to curb the illegal exchange and over-prescription of opiates, but they're still legal, and we're only conditioned to stay away from illegal drugs. The mythology surrounding heroin is downright dangerous, and it shouldn't distract from the very serious problem of prescription pill misuse. If you take an excessive amount of opiates, stimulants, or other prescription pills, don't assume you're safe because it's legal. Reach out for more information about our self-directed substance use programs at Freedom Model Retreats.